The setting: Puerto Vallarta. I am there on a 48-hour turnaround, as part of a mileage run. I have been experimenting with unstructured vacation lately, so I don’t have any activities set up. 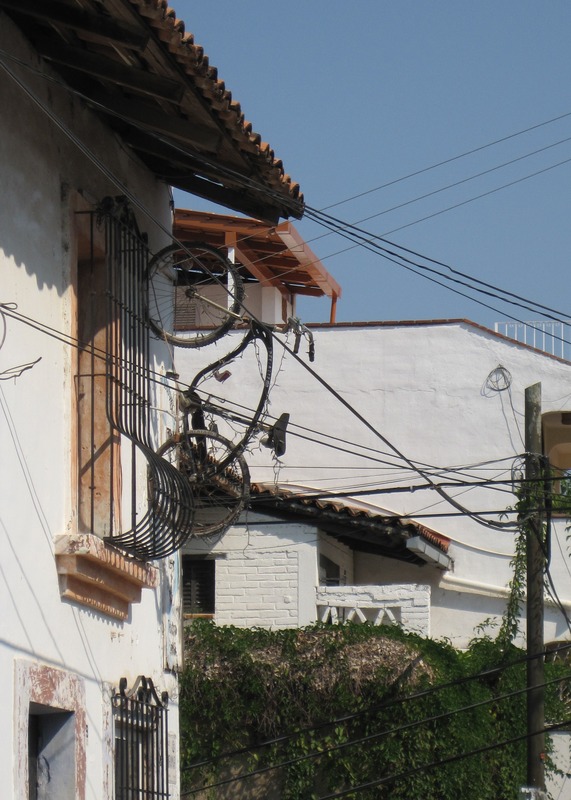 However, I have heard from friends that there is mountain biking to be had in PV, so, after doing some internet research, I set out looking for the two bike rental shops near the town center. I am somewhat hampered by my inability to ever write down street names and numbers. I always think I’ll remember and I never do, but I don’t learn. Even so, I manage to find the first place – probably because it’s fairly close to the town center. It doesn’t matter though, because it’s dark. The owner is probably out taking some lucky tourists on a bike tour. But there are people in the shop next door so in my pidgin Spanish I ask if the bike shop owner is expected that day. A lady tells me that he won’t be back until tomorrow, but then points up the hill and, I think, tells me there is another shop up there, somewhere. I am pretty sure this is the other one I discovered thru my internet search. I kind of remember the name of a cross street it’s near. Armed with this scant information I hoof it up a giant staircase. There’s a very insistent cat at the top who occupies a good 15 minutes of my morning, but since, despite my request, she is unable to produce a mountain bike for me to ride, I leave her to pester other tourists while I resume my search. I wander around the cross street for a few blocks but there’s no shop in sight. I am about ready to give up when I decide to make one last push, uphill, for another block. That’s when I see it – like a beacon shining in the distance. Never has a bicycle looked so beautiful. As it turns out, the bike is part of a sign for a tavern, but, oh happy day, it’s across the street from an actual bike shop. And yay, someone’s there, and they have a bike that fits me. Not only does it fit me, but it’s actually a near-replica of one of my own bikes at home. For the first few kilometers things go really well. I find the first few turns and follow a quaint cobblestone road, gradually climbing away from the ocean. It’s not quite technical singletrack, but cobble is really fun to ride on, and I like this less developed side of Mexico. I pass through Paso Ancho, then a few more small towns. As the landscape becomes more rugged and less populated, I come to a major turn that I had been told about. I had been told that I should keep right at this turnoff, then continue to stay right. I am told the trail will get steeper from this point until the terminus at the waterfall. There was mention of a gate at the entrance to the waterfall, and a stand selling drinks and snacks. Did I mention that I had some (not enough) water, but very little food with me? No matter, there would be a stand selling drinks and snacks. Next week – what the tourist saw.